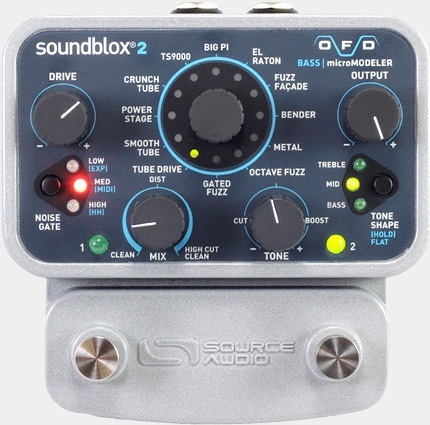 The Soundblox 2 OFD Bass microModeller packs a comprehensive, low-end enhanced collection of new and vintage overdrive, fuzz, and distortion tones into a single stage-ready stomp box perfect for bassists of all genres. Each effect has been meticulously crafted to provide precise and naturally responsive tones, from warm and thumping tube overdrive to bass-in-your-face fuzz. The OFD also features Lo-RETAIN, our special low-end preserving algorithm. Plus each effect can be blended with the original dry signal to maintain the thumping essence of your bass tone. The Bass OFD features incredibly natural modelling of twelve bass specific versions of tones inspired by classic gear including Marshall Amplifiers®, Mesa Boogie Amplifiers®, the Fulltone OCD®, Ibanez Tube Screamer®, EHX Bass Big Muff®, Pro Co Rat®, Tone Bender®, Fuzz Face®, and Octavia®. The box also includes a super saturated tone called METAL for an especially growling distortion, an extremely nasty, spitting fuzz called the GATED FUZZ (inspired by the Z-Vex Woolly Mammoth®), and Source Audio’s own CRUNCH TUBE, which delivers an extra aggressive tube overdrive. The Bass OFD is housed in a compact and extremely durable cast-aluminium casing. Its sturdy exterior and relay based buffered or true bypass switches are built to withstand endless gigging and rehearsal and the compact 4.5 x 4.5 inch footprint easily finds a place on any sized pedalboard. It also offers a multitude of forward thinking and useful design functions like clean and dirty MIX control, Lo-RETAIN, preset morphing, easy-to-adjust internal noise gates, and external Hot Hand, Expression Pedal, or MIDI control. 1Diverse Sound Palette — Featuring extremely natural modeling of 12 bass versions of classic overdrive, fuzz, and distortion tones. 32 User Presets easily recalled via two footswitches. 4Clean and dirty MIX control to blend the effected tone with the original dry signal. 5Lo-Retain: Source Audio’s low-end retaining algorithm. 63-band tone control — select between “treble”, “mid”, and “bass” for precision tone sculpting. 7Noise Gate — easily activated 3-level noise gate. 8Universal Bypass — selectable buffered or true bypass. 9Multi-function In — use an expression pedal or the Hot Hand Motion Sensor to morph between presets or manipulate any of the six assignable parameters. 10MIDI Capable — the Multi-function In jack also allows MIDI access to presets and parameters. 11State-of-the-art DSP — Our proprietary 56-bit Digital Signal Processor, the SA601, and crystal clear 24-bit converters. 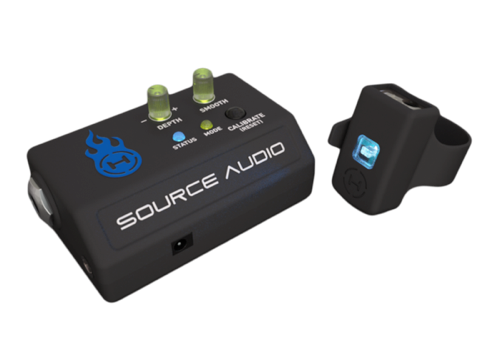 The Source Audio Dual Expression Pedal delivers precision response and smooth action in a durable cast aluminum housing. Dual TRS expression outputs make it possible to control two effects units simultaneously. The pedal is compatible with any model or brand of effect that features a TRS expression input. 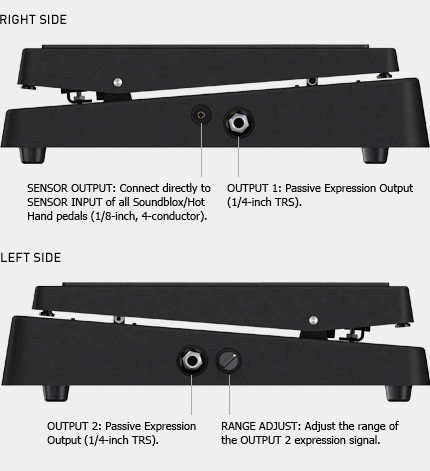 The Range Adjust Knob sets the bottom point of the expression range. Plus, a special Sensor Output connects directly to any Hot Hand®, Soundblox®, Soundblox 2, or Soundblox Pro pedal for real-time control over filter sweeps, effect modulation, LFO speeds, wet/dry mixes, drive levels and more. 1Two Isolated TRS Expression Outputs – simultaneous control over multiple effect pedals or rack systems. 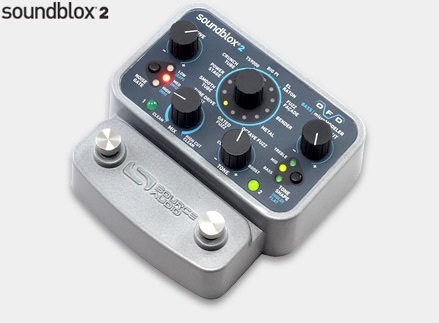 2Sensor Output — 1/8-inch; four conductor output compatible with all Soundblox, Soundblox 2, or Soundblox Pro pedals. 3Range Adjust Knob — Adjusts the range of expression signal sent through the outputs. 4OUTPUT 1: sends expression signal out via either 1/4 inch TRS cable or 4 conductor Soundblox compatible 1/8 inch sensor cable. 5OUTPUT 2: sends expression signal out via 1/4 inch TRS cable. Hot Hand 3 connects to all Soundblox®, Soundblox 2, Soundblox Pro, or Hot Hand pedals via the 1/8” SENSOR OUTPUT. The receiver base station also features a standard 1/4” EXPRESSION OUTPUT compatible with most third-party pedals equipped with a 1/4” expression input, like the Boss PS-5 Pitch Shifter, Eventide Space Reverb, Line 6 DL4, and many more. 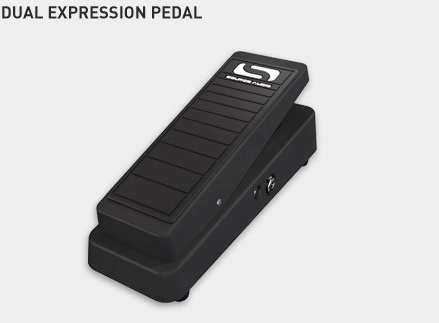 · Compatible with all Soundblox, Soundblox 2, Soundblox Pro and Hot Hand pedals. · Works with most third-party effects equipped with a 1/4” expression input. DIP switches facilitate third-party effect configuration. · Select between 3 different motion axes (X,Y, and Z). · RF transmitter capable of transmitting over 100 feet. · Rechargeable/replaceable lithium ion battery. · 1/8” SENSOR OUTPUT and 1/4” EXPRESSION OUTPUT. · DEPTH and SMOOTHING controls adjust effect amount and ring sensitivity. · Use up to 4 units simultaneously with no interference.